Help CentreUsing SuperControl Configuring my propertyHow do I enable short breaks? 1. To allow short breaks go to Properties > Edit > select property > Settings > Go. 2. Scroll down to Short breaks and choose your short break model; Fixed price for number of nights OR Daily prices. Fixed price for number of nights - Allows you to enter a price based on number of nights eg. 1 night mid-week, 2 nights mid-week, 3 nights mid-week etc. Daily prices - Allows you to add a price based on each day eg. Monday price, Tuesday price, Wednesday price etc. Use first weekly rate for weekly bookings: If a customer books a week that crosses two separate price bands, by default SuperControl will calculate the price on a daily basis. If you tick this box SuperControl will use the weekly price of the arrival date for the full week. Pro rata after first week: Tick this box if you would like the 8th night onwards to be calculated pro rata (week rate divided by 7) rather than according to the short break pricing model rule that you have set up above. Use a percentage of the weekly price to calculate short breaks: If this option is ticked it will open up percentage fields allowing you to enter a percentage price for each short break duration. Type in a percentage figure here of the weekly price to calculate a short break price. Calculate short breaks across price band: SuperControl will calculate an average price across the price bands. 3. 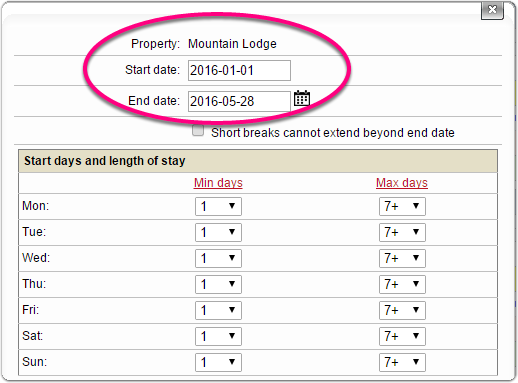 For your start days and length of stay you can customise which days you want to allow short breaks. For example, if you are fully flexible and you can arrive on any day for any number of nights your settings would look like image 1. If you only allow mid weeks and weekend stays only, your setings would look like image 2. 4. You can also enter a minimum price. This should be the lowest price you would offer for a short break. This works as a safety net in case of any errors inputting pricing. 5. Days prior to arrival to always allow short break: This rule will apply even for periods when you do not normally offer short breaks. eg. if you enter "14" and you have availability available in the next 14 days from today's date, then it will automatically enable short breaks for the next 14 days. The days will rollover as the dates pass by. 6. Click Save once you have chosen your settings. 7. Next go to Properties > Edit > select property > Price planner > Go. 8. If you want to add short breaks click on the date your short breaks should start within the Short breaks row. 9. Next you can choose the date range for when you would like to allow short breaks. Once you click on your start date a pop-up window will appear allowing you to enter an end date. Your start days and length of stay will populate based on your settings within Properties > Edit > select property > Settings > Go. The tick box Short breaks cannot extend beyond this date: It is important to set an end date for short breaks, otherwise the short break could fall into high season. Prev: How do I add/edit my short break and weekly prices? Next: How do I change my start days accepted for full week bookings?